Living in Southern California, we are blessed with 263 days of sunshine a year so the topic doesn’t come up often, but with April Showers and El Nino in town, I figured this could be a great topic to cover this week! Growing up in Georgia we played golf in any weather condition so long as there wasn’t lightning. The Doppler radar would be on in the pro shop with the staff tracking the next big storm. Guys would come in saying, think we can still get in 9 holes before the big stuff hits? But since I moved to San Diego, the culture is a little different. Even if it’s misting outside, the golf tournament or outing must be cancelled, right? I’m here to tell you that yes it’s a bit uncomfortable to play golf in the rain, but if you’ve signed up for a charity golf tournament and it’s raining, with no thunder and lightning, chances are the tournament is still a go. It takes a lot of planning and hard work to host a charity outing, so cancelling or moving the event to another date is a nightmare. Now if it’s an outing with your buddies and you’ve only reserved a tee time at a course, you don’t have to play. The great thing about golf courses is that there is no penalty for cancelling last minute (not sure why they do this since it’s bad for their bottom line) but it’s a bonus for those of us who have work get in the way of our golf from time to time. 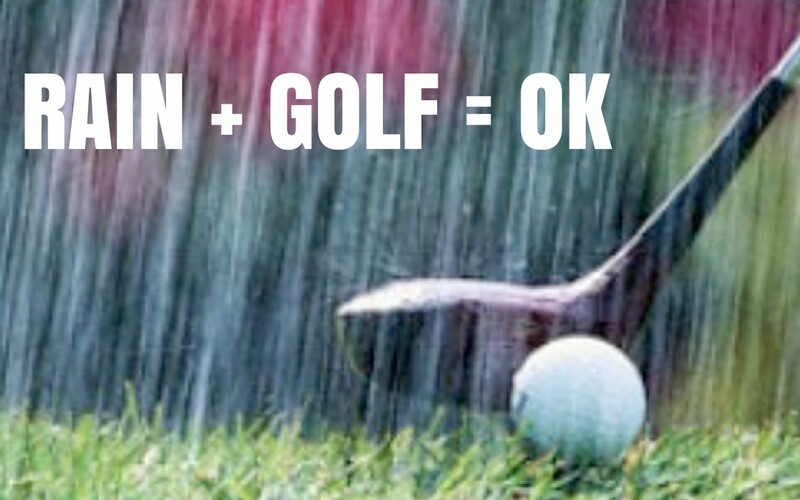 So the next time you see water falling from the sky and you have golf planned, ask yourself how easy it would be for the host to postpone or reschedule their event before calling in and asking if the event will be cancelled. And unless you’re the Wicked Witch of the West, you shouldn’t melt out there, so grab your rain/wind breaker and have some fun! Please let me know if you have any more questions and if you want more tips like this, check out our $5 membership that is packed full of ultimate guides and videos to help you on your quest to boosting your biz with golf!